Sound familiar? We’ve all done it – we tackle a huge bed of weeds, liberate the garden plants and exhausted, pile up the weeds and breathe a sigh. Then, before you know it, there they ARE AGAIN!!! Why? Weeds “come back” because they never left. There are still either roots or seeds in the soil. When you start weeding after plants have bloomed, it is very likely that you will end up scattering seeds everywhere. Some plants are even capable of ripening seeds on cut flower stalks, even though they have no seeds yet (or the seeds are very green). Then there are the tenacious roots, like morning glory that ALWAYS leave a bit of root behind no matter how carefully you try to tease them out. They sprout from root pieces and off they go again. Even with less insidious rooters, if the top of a plant breaks off, new leaves will frequently sprout from what is left. The seed bank in the soil is a source of new plants. Yes, there is a large store of seeds in the soil – the seed bank (that’s the technical term). Not only do weeds generally produce a very large number of seeds because they are really good at reproduction – early and often – some seeds remain viable for years and even decades. Even though lots of plants do this, weeds have developed persistence to a high art. Not only can they produce a LOT of seeds, the same plant can produce – in the same year – some that germinate quickly and others that don’t germinate till later years. Of course this is a great survival strategy – if this year turns out not to be so great, then there will be seeds that can germinate in later, perhaps better years. The good thing is, if you remove weeds, sometimes there are nice plants underneath that have been waiting for the chance to come back. This does work both ways – removing blackberries often results in some other weed that was suppressed, taking their place, especially if they covered a large area. Then you have a different weed to deal with. You just have to expect it will happen. Weeds return because they are brought in by animals, humans, and weather. Even though you thoroughly clean the garden of weeds, seeds and plant parts, there is still the seed rain – a process whereby stuff literally rains down on your plot of ground. The wind blows seeds, animals carry parts of plants, bury seeds, and poop seeds out. Did you ever notice how some plants pop up right next to a tree trunk? Perching birds digest various berries, and drop the seeds right where they perch. Squirrels cache seeds, and stuff just FALLS when the wind blows. Humans and other animals track seeds and plant parts in on their feet. So you will always have new things coming in. Those are a few reasons why weeding is never done. 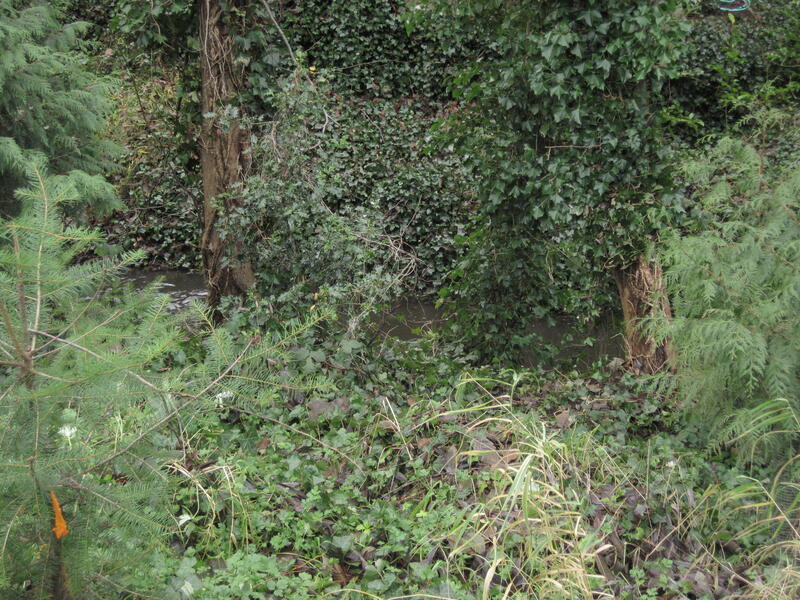 3″ -6″ of arborist chips are heavy enough to suppress weeds in this native planting. Medium bark is good as well and a little more dressy. Fine materials are less useful. Get out there when the weeds are small and the soil is moist. Even if seeds keep sprouting, they won’t get big enough to bloom. 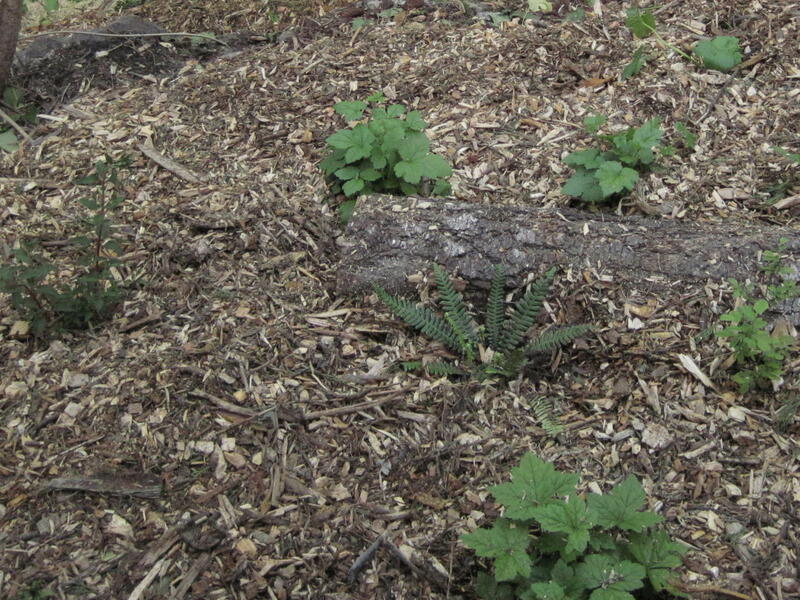 Use thick mulch after you clean up – bare ground is begging to be colonized by something, and weeds are specialists at getting the jump on everything else. If they germinate IN the mulch, it’s easy to pull them out. If they germinate UNDER the mulch, it’s more likely they will use up their energy trying to reach the light, and if it’s thick and heavy enough, most won’t make it. Coarse wood chips are best, compost just grows better weeds, so put the chips on top of the compost. Allow some time before you plant again. If you mulch things up well and wait for the resprouts, you can get the second wave, or even a third wave of weeds and substantially reduce the number of weeds that will be around to compete with your chosen plants. BUT YOU HAVE TO COME BACK OFTEN. A really bad area needs to settle down for perhaps a year before planting. Then you don’t have to pull out the new plants with the weeds because they are all entangled. BE VIGILANT. Do not turn your back and leave for months at a time. Just a weekly visit to your garden for a weeding session will reward you with less weeds and less work. Plant evergreens and woody vegetation when possible, and cover most of your ground. In general, shrubs, perennials, groundcovers, and trees together will created a multi-level cover for the ground that will shade out weeds. But leave a little space for birds that like open habitat, and for ground-nesting pollinators and beneficial bees and wasps that need loose sandy or gravelly places with no vegetation. *Taylor Gardens can help you map your plan of attack if weeds are overwhelming you. Contact Jeanie via the website form we’ll coach you on a weeding program that works for you.